Dental implants may be a solution for your missing tooth or teeth. 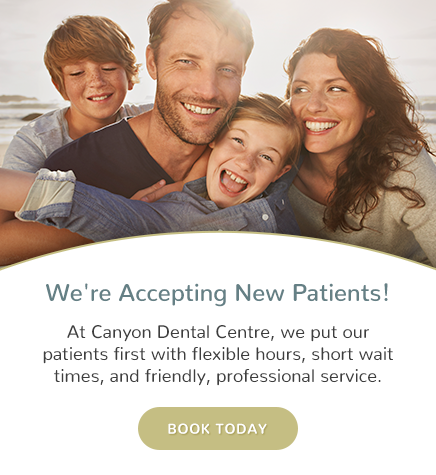 Canyon Dental Centre provides dental implant services for patients living in the North Vancouver area. Dental implants are composed of an artificial tooth root that is placed into your jaw to hold a replacement tooth (crown) or bridge. They are used to replace single or multiple teeth without affecting surrounding teeth. They provide support for bridges and eliminate the need for partial dentures. They provide support and add comfort for single dentures by securing them in place. Who might consider dental implants? Dental implants are an ideal option for people in good general oral health who have lost a tooth or multiple teeth due to factors such as periodontal disease, injury, or various other reasons. Why would I consider dental implants? Dental implants look and feel like a natural tooth. They have become the treatment of choice when replacing missing teeth. Dental implants are also designed to integrate into the structure of the jawbone; this helps to prevent the bone loss and gum recession that often occurs after bridgework and dentures. Dental implants are do not alter the surrounding teeth. This helps save the structure of your teeth and benefits oral health in the long run. Dental implants allow you to comfortably eat and talk without the use of messy glues and dentures.